Five years ago the design concept was much more modest then today and believing that we were retiring soon at the age of 55 we began purchasing supplies for the house. Our first major purchase was the solar system. I researched manyy brands but decided to go with Outback as that is the system that was being used in the Earthships and all the reviews were positive. I used there design tools with the anticipated load and I bought the entire solar system. – (20) Kyocera 180 watt panels. – Outback FX60 charge controller. – Outback 3600 watt 24 volt inverter. – Flex 500 AC and DC panels. Now that the design has been finalized and the electrical load needed by my wife added to the system, I have concluded that the 24 volt inverter and FX60 charge controller we had purchased will not be adequate! The good news is that we will probably use those parts on the garage/shop but the bad news is we have to buy a new system. Recent research has revealed new configurations from Outback that should make the installation a little easier and less costly. We now will be going with a 48 volt system and FX80 charge controller. All lighting will be low voltage (48vdc) LEDs. I have not found 48vdc pumps yet but did find a 48v to 24vdc converter from Solar Concepts that may have to be used to solve that problem. The refrigerator will be 48vdc as well. 120vac power will be provided from the inverter for devices that can not be purchased in a DC version. This week has been spent designing the plumbing systems. This has been a little more intense then originally anticipated due to the slope requirements of the waste pipes. In a normal house this is not a major issue because the waste are below grade and can be sloped simply by digging a deeper trench as long as the depth works with the municipal sewer system or for the private septic system. In a house that is re-using grey water in the planter beds elevation is critical to assure that the proper slope is maintained and making sure that the piping is high enough for the water to be usable at the plants. If you review the drawings provided in the previous posts you will see the indoor planter beds. in order to maintain the proper slope I have done a layout that runs some of the waste in the walls and then drops to just below the slab so the the elevation of the piping at the flower beds is less than 4″ below the slab which should work fine. The greenhouse planter beds will be lower than indoor beds so drainage should not be a problem. Since the basic concept of an Earthship is to use low voltage power for as much of the equipment as possible, all the lighting and pumping systems require DC pumps which lends itself to using RV type pumps effectively. However as you will see in my discussion of the electrical systems that has raised new issues. – Only one room deep. – Full height windows along the entire south wall. – Full length green house along the south facing wall. – Rain water collection from roof for drinking and household use. – Re-use of all grey water for planter watering. – Multiple planter beds indoors for food production. – Wood stoves for supplemental heating and cooking. – Propane backup water heater. – All lighting to be low voltage. – All pumps to be low voltage. 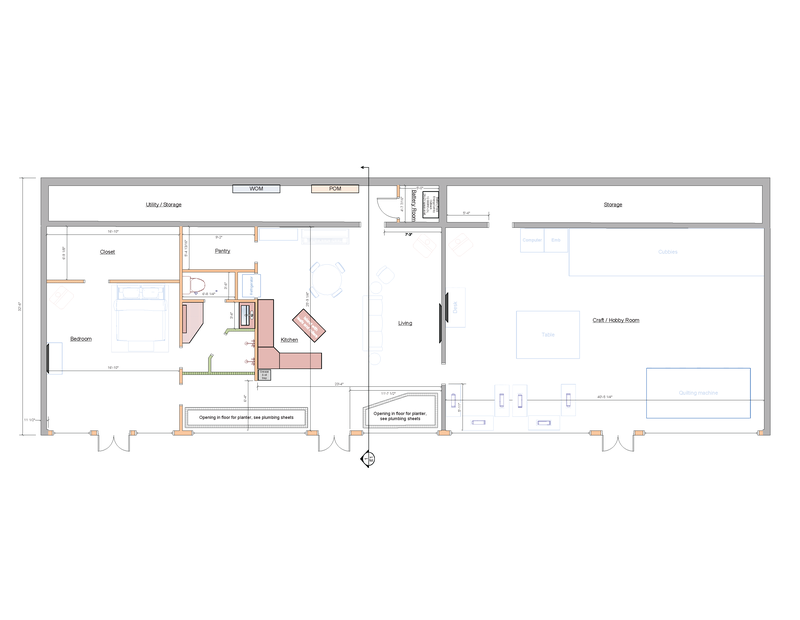 – Insulated concrete walls with interior wall insulation removed to expose mass. – Solar panels mounted on a stand mounted behind house with north/south tracking. – 400 watt Wind generator mounted behind house. – At least (2) 1700 cisterns to be used for water storage. – Water filtered with particulate, charcoal and UV filters. – Hot water loop to be used to provide nearly instant hot water to facets. – PEX tubing to be used for all plumbing requirements. 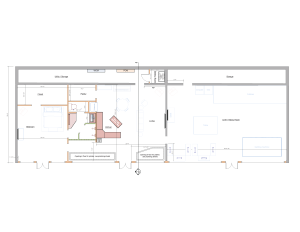 – Provisions to be able to drain the system during times of un-occupancy. – 3600 water solar array with a 3600 watt inverter. – 800 AH battery bank (100 hr rate). 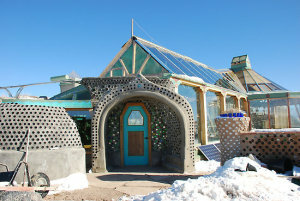 Throughout those variations of the building construction material, use of the basic Earthship systems has never changed. Over the last five years we had added four cargo containers to the property for storage and a few years ago we converted one to a small cargo cabin. 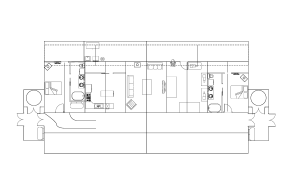 We added an outdoor shower and a composting toilet to allow us to visit the property without bringing our motor home. 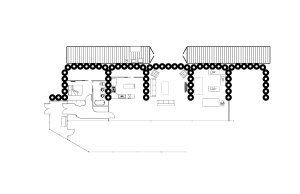 After those experiences last year we finally decided that due to labor concerns with the tires and issues with building with containers, we would use an insulted concrete foam (ICF) form system and the basic floor plan was finalized. 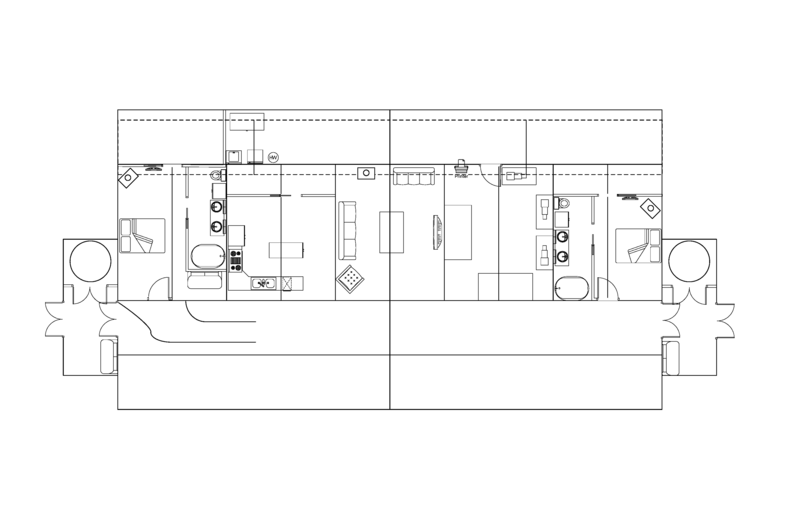 Well sort of finalized, during the last few months the floor plan has been tweaked to accommodate the actual system designs. The following are the most recent building images using ICFs. 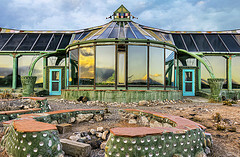 Part of the Earthship comcept is the use of a greenhouse along the entire south facing area of the house. As you can see on the above images there is not a greenhouse attached yet but will be included in the final build. I will try to finalize that detail soon and post the final image. Of course after purchasing the land the planning of the house began. Somehow we stumbled across the Earthship concept. We knew we wanted to be completely off grid and this building method seemed to be a possibility. We purchased all the books and began to study the system. 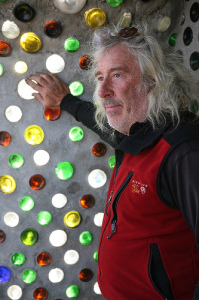 The Earthship is the brain child of Michael Reynolds in which a house is completely off grid using passive solar for heating, solar panels for electricity, roof rain water collection, the use of water four ways and built from tires! In 2008 we were attending a bowling tournament in Albuquerque so we decided to run up to Taos and stay in the Phoenix for a night and see it first hand. Arriving at the Phoenix we were amazed! This is a beautiful building built from tires! We arrived on a 40 degree day outside and the indoor temperature was 68. Now remember that the Phoenix has NO traditional heating, only a single fireplace that we did not use. The building is full of plants all watered from the grey water generated from the showers, sinks, etc. I noticed while touring the building that the showers were not enclosed, in fact there were basically no full height walls surrounding them. My thoughts quickly turned to the next morning when my wife would be showering open to the environment and subject to the chill of the early morning. I was concerned! Well the following morning came and to my delight the temperature had dropped to only 65 degrees without any supplemental heating and overnight temperatures dropping into the 30s, but I was still concerned about showering in the open. Well amazingly we both were VERY comfortable. I thought back to my college days many years earlier and remembered that comfort of a human body is greatly effected by the temperature of the surrounding surfaces and with the massive walls still relatively warm they were not drawing heat from our bodies and therefore we were very comfortable. At that moment I knew that this is how we were going to build! In August 2007, we were traveling back from a race in Ohio. We had been talking and looking for a possible location to buy land and retire. The plan was at the age of 55 we would be retired. I had the 55 number in my head for many years as a goal due to relatives doing the same. I was 50 at the time so time was running out! Earlier in the trip we had passed through some small towns that looked promising and had actually taken down some realtor names. Joyce was driving the motor home and I was now napping. I awoke to the words “do you want to stop and look at some land?”. We were now in the middle of nowhere, I wasn’t even sure where I was. I said sure? We pulled our 40′ rig pulling a 24′ trailer into the dirt parking lot and in we went to the office. We met the owner of the land who proceeded to talk to us about the lots available, pricing, etc. He then told us he could show us around if we wanted. We looked at each other and said “why not”, we don’t have to be back immediately. We set out on a 6 hour adventure that turned out to be a lot of hiking. Looking at each of the lots, hiking to find the property boundaries, etc. After walking up and down hills for hours we stumbled across a lot with an amazing view of the valley below and mountains in the background. At that moment I knew this was the one. The lot didn’t have known water on it, but as you will see later that didn’t matter to us. It was now too late in the day to start the paperwork so the owner offered to allow us to stay in the parking lot overnight and that is what we did. The next morning we were the proud owners of 17 acres. And the fun begins with the creation of this blog!